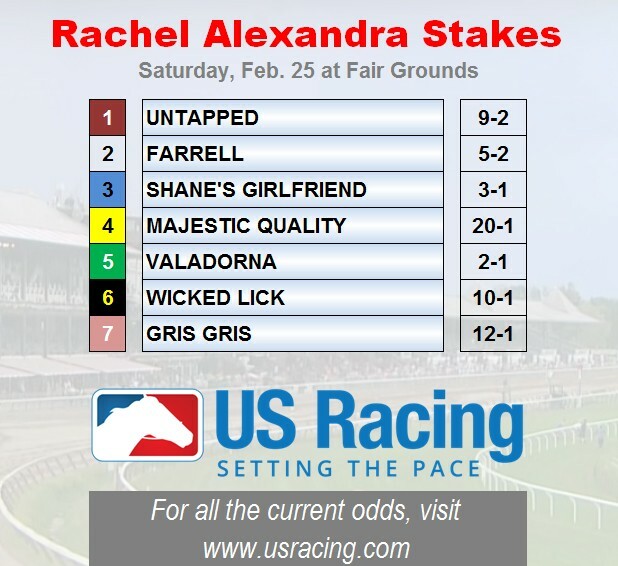 Valadorna is clearly the one to beat in the Rachel Alexandra Stakes (GII) at Fair Grounds on Saturday, but I’ll be using trainer Keith Desormeaux’s Majestic Quality in all my exotic bets. Majestic Quality is still winless in seven starts, but I think her efforts on Nov. 26 at Del Mar and on Dec. 30 at Santa Anita were deceptively good, as both produced decent Brisnet speed ratings and very good late speed rations (my own measurement of late energy disbursement). After a turf try that muddied up her form and on a track that is kind to late runners, I think the daughter of Quality Road has a shot at a big price. Of course, to reach the winner’s circle, Majestic Quality will need to get past Valadorna, who has the look of something special. After a solid runner-up performance in the Breeders’ Cup Juvenile Fillies (GI) in just the third start of her career, the daughter of Curlin won her sophomore debut in impressive fashion and should be even better on Saturday. Shane’s Girlfriend, trained by Doug O’Neill and ridden by Mario Gutierrez — the same trainer/rider combo that guided Nyquist to victory in last year’s Kentucky Derby — is another strong contender on the basis of her dazzling score in the Delta Princess Stakes (GIII).